Empanadas are small pies. In most cusines one can find one form or the other of such small filled pies. We call them „pirukad“ in Estonia. 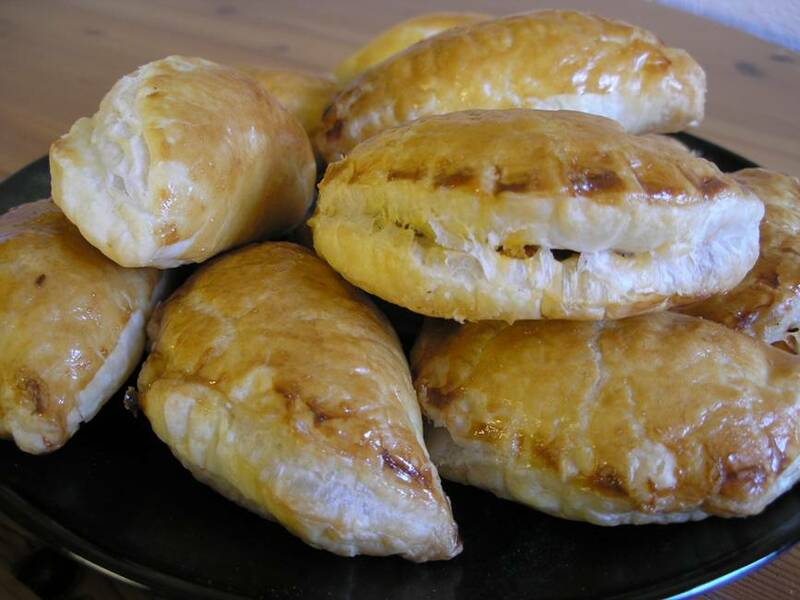 They can be made with various fillings, for example as savoury with minced meat, shredded chicken, tuna, salt cod, chorizo or sausage or with jam, fruits or dulce de leche in Uruguay for example. Put the chicken into cold water with 2-3 bay leaves, celery stems and 3 teaspoons of salt. Bring to simmer at medium heat, then turn down the heat and simmer the meat for 1.5-2 hours until the meat is soft and falls off the bones. Save the broth for other dishes or freeze it for later. Chicken broth is very good against a cold for example. Cool the meat and shred into small pieces. Heat 3 tablespoons of oil in a pan, cook the onion in the oil until it turns glassy. Add the shredded chicken and fry until the chicken starts to take slightly brownish fry colour. Add the tomato paste and chilli or pepper to season to your taste. You can use a cup to cut round pieces of rolled out pastry, fill with the chicken mix and press the sides together using a fork or use a special appliance for making such small pies that has the cutting edge on one side and pressing together the „teeth“ close the edge around the filling. Both methods are fine. Mix the egg in a bowl and brush the empanadas on the pan. Best to use the baking paper on the pan to avoid sticking.